What’s most important here are the fundamentals: telling a compelling story that drives your supporters to take action. Write an email that you think will really resonate with your donors, tells a compelling story, and has a good theory of change — give them a meaningful action they can take that will actually bring about a change they want to see. Don’t worry too much about length or other factors at first. Your biggest tool is going to be great writing. You’ve probably heard a lot of rules of thumb: use a one word subject line, make the button really big, keep your emails short. And on and on. The good news is there really aren’t any hard and fast rules, just general guidelines. Every email list and group of supporters is going to behave differently, so you need to figure out what yours wants. Keep in mind that will change over time too, so this will be an ongoing process. Not even the most experienced email writers can predict what their list will respond to six months down the line. The bad (or rather fun news, for all of us emailers) is that you can and should test the various email characteristics for yourself. If you have questions about testing for your large list, or figuring out the right move for your small list, get in touch with us. We’d love to work with you to set up a great program. If your list isn’t big enough for testing (you’ll need at least tens of thousands of people), then write the best email you can and always keep your donors in mind when you’re making decisions. Watch what large organizations are doing with their emails (and more importantly, what they’ve stopped doing) to get a sense of what is testing well for other groups. First you’ll need to tackle the actual writing of the email. You can either designate this to one person on your team, or have multiple people come up with drafts that you can combine or use separately for copy tests. If your organization has the capacity to write emails on different topics or from different angles, this is one of the best ways to invest time in your digital program. 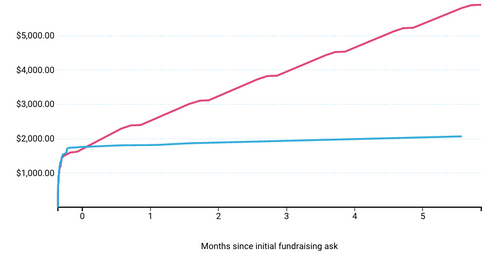 You’ll often see a large difference in donation rates from one email pitch to the next. And most importantly, make sure to have your work proofread by a colleague (twice!). While you’re working on your content, you’ll want to pull a list of all of your supporters from your database. If you’re testing this email, make sure to work out what group sizes you’ll need to pull. You can read more about testing in our tutorial here. Once you’ve got your groups and content all set, you’ll need to send yourself and your colleagues test emails. Check them again for grammar and check and double check that all your links work and contain refcodes if you’re using them. Having multiple sets of eyes for this step will help. When you feel really really confident, hit the send button and watch the donations roll in on your ActBlue page (it’s addicting!). Make sure you have each and every step to sending an email at your organization documented, and that everyone on your team has access to it. That way, you’ll be able to handle any news story that comes your way. It’s important to work out your rapid response system in advance and hold people to their role. Reducing the number of people who need to sign off on every message will make it possible for your team to send out emails as quickly as possible, allowing you to capitalize on a relevant news story. Why are stories important? We all respond to storytelling — it’s how we define ourselves, and how organizations can define themselves. Your job is to tell your organization’s story to donors in a way that makes them want to be a part of it. If a supporter feels an emotional pull, they’re going to be motivated to take action. Facts and numbers can be great for backing up your story, but it’s more important to provide your donors with a narrative that compels them to pull out their credit card. Make sure every email you send contributes to your organization’s ongoing narrative and goals, and that it’s in the right tone of voice. That means you should maintain a consistent style, but also keep it friendly. You’re having a conversation with supporters, not writing a report. Why now? Why me? Will it help? How much? If I do this, then this will happen. For example: If I give $5 today, then the campaign will be able to hire an organizer to reach more voters in my neighborhood. Here’s your new mantra: You are not your list. When you’re crafting your message, imagine your typical supporter and write to them. Above all, make sure your writing is engaging and that you have a story to tell. Always remember that something timely/urgent is going to win your donors over more than even the most well-crafted narrative. Responding to the news with an urgent and important email send will provide your donors with a motivation and evoke that emotion we mentioned previously. If you’ve got the time and resources, we highly recommend doing a content test. Send out two or three different emails with either completely different topics, or slightly different narratives and see what your list responds to. It’s not always immediately clear which story will resonate, and this takes the guesswork out of it. Remember to take a step back and think about your larger organizational narrative and the kind of stories you want to tell. It’ll make your program more successful in the long run. Remember that you’re competing for attention in the inbox with other organizations, friends, and family, so readability is key. Try to start off with a sentence that’s engaging — whether it gets them excited, intrigues them, or even makes them angry. Keep it to one sentence if possible. Keep paragraphs short - blocks of text can be intimidating. Your first ask should come after the first couple of paragraphs — the earlier the better. If you wait any longer you’ll lose interest, or you’ll risk donors having to scroll down on their email browser to see any type of action. Whether using ActBlue Express Lane or linking text, be sure to bold all of your links. As we mentioned earlier, you might think that only shorter emails work, and while it’s true that you’ve only got about 3 seconds to hook your reader before they click away, you’re not necessarily looking for everyone to make it to the end. The important part is that you have clear asks and compelling content. Many groups have had success with very short emails. We’ve tested this at ActBlue, and moderate length emails tend to win out for us because they work with our narrative and our list. That being said, make sure every word counts. If you can cut down and tighten your email, then you should absolutely do that. Note that shorter paragraphs are especially important to mobile conversion rates. Long paragraphs of text can negatively affect the readability of your email even more so on a mobile device. More and more donors are contributing this way — 24.7% of contributions we processed came from a mobile device in the first quarter of 2015. You might feel uncomfortable asking for money right off the bat, but it’s a skill that anyone can learn. And if you and your supporters are truly committed to your vision, they’ll be happy to give. Be realistic. A donor’s money isn’t going to help you cure cancer (unless you really are doing cancer research). But it will help to fuel a movement. Think about what you really need the money for, and let donors know. If you need TV ads, tell them how much each one costs. If you need office supplies to make posters for a rally, that will work too. Communicating your needs to donors and putting a human face on your work will increase their likelihood of giving. Be active. Don’t say “Click here to give $5” or “If you’d like to support our campaign or organization, you can donate here.” Make the hard ask, and give them a reason to give. Something like “Can you donate $5 right now so we can open a new field office?” And make sure your donation links are bolded and stand out. Again, your first ask should come relatively early in your email, ideally sometime after paragraphs 2-4. In a traditional email, you’ll follow that up with another 2-4 paragraphs and another ask. This second set of paragraphs should argue something slightly different. Try and take a different but related approach to convincing someone who may not have been sold by your initial paragraphs to give when they get to that second ask. Remember to keep these paragraphs relatively short, so that your email looks visually appealing and easy to read. If you’re a candidate just starting out, we strongly recommend that your launch ask is for donations. It will be your most urgent need at that point, and the list you start with will likely be made up of past supporters, so they’ll be primed to give right away. Make sure you don’t miss out on an important opportunity to jump start your campaign or cause and get supporters invested. Subject line tests are probably the most important types of tests you can run. Your supporters can’t donate if they don’t open your email, so subject line tests can dramatically increase conversion rates. You’ll see open rates that vary 2-6 percentage points on average based on subject lines and response rates will often vary in proportion. However, you should always go with the subject line with the highest response rate. For example, a flashy subject line that doesn’t match the content could lower the overall response rate. A good rule of thumb is to test three subject lines per email. Usually you measure the this by number of donations, and if that doesn’t give you a clear answer, by open rates. Sometimes you’ll have a really great subject line that gets a lot of opens, but it’s not attracting the donor types you want, so that’s why you shouldn’t get too hung up on open rates. We try to always include at least one one-word subject line. Despite our skepticism, they they often turn out to be our best performing subject line. Other good subject lines will highlight a buzzword or popular topic, or entice the supporter to read more. You can’t treat your list like an ATM if you want to keep your supporters. You also can’t send them a handful of emails a year and expect to get great action rates. But with a bit of scheduling and cultivation, you can send frequent emails without increasing unsubscribe rates. Your email schedule is dependent upon your specific list and the size of your organization. For example, if you’re in the home stretch of a candidate campaign, you can send more frequently, but make sure that every email is important and unique. Work backwards from your budget: how much do you need to raise, and how much do you typically receive from each fundraising email? For candidates, keep in mind that as you get closer to an election, you’ll usually bring in more money per send. At ActBlue, we see our highest volume days in September, October, and early November. To give you some context, we processed over $38.2M in September of 2014, but just $10.2M in February of the same year. Monthly donations can be your secret weapon, and there are a whole host of reasons why they’re great, from monthly budgeting to supporter cultivation. But the most important one is that they raise more money. You can reduce your workload significantly by asking your donors for recurring contributions. Take this graph, for example. The blue line represents an email send with a one-time ask and the pink line represents an email with a recurring ask. After the initial send the one-time ask brought in $1,770 and the recurring ask brought in $1,635 — not much of a difference at first. But five months later the recurring one has brought in $5,900. This example illustrates how much money you can raise in the long-term by doing the same amount of work as you would sending a one-time ask. You can read further about recurring contributions here. Despite your schedule, if a really great fundraising opportunity presents itself, make sure you take it. You don’t want to pass up a potentially huge moment because you’re not ready or working on other projects. The emails that aren’t planned have the potential to do exponentially better than the ones carefully crafted ahead of time because they have urgency. So make sure you’re flexible enough to handle opportunities as they come in.